Automatic is a combination adapter and app that interfaces with your car’s on-board computer. The adapter gathers data on fuel efficiency, miles driven, and bad driving habits (jackrabbit accelerations and hard braking). The app can then give drivers insights into their driver profile, their car’s mechanical condition, tell you where you parked, and in an accident, can even notify loved ones and signal for help. Ever wonder what that check engine light really means? Automatic can tell you the exact error code, what is usually the causing the problem, and connect you to local mechanics. As a consequence of gathering all this data, Automatic is able to issue yearly “Your Driving Year in Review” reports. Here’s mine. 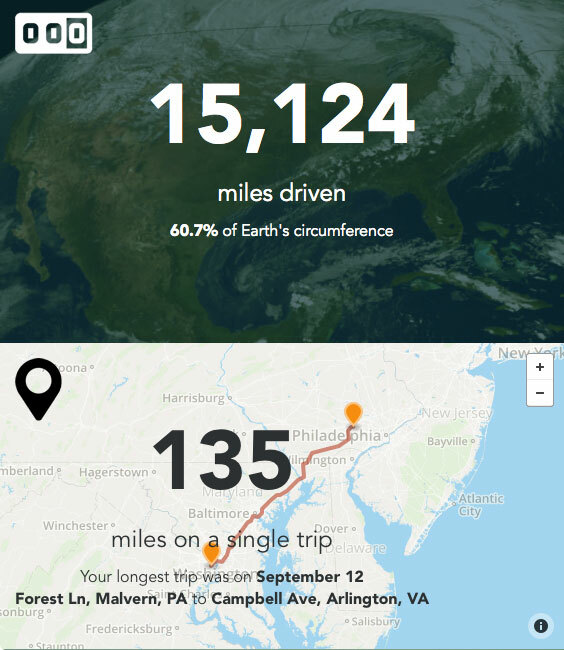 I commute far too much, drive too fast to optimize fuel efficiency, and sadly, when you add up all my driving time, I spend more than two weeks a year behind the wheel. Newer cars are starting to include these tracking features standard, but for the majority of older vehicles on the road, tools like Automatic can provide actionable data right now. And since driving is one of the most dangerous (and unhealthy) activities we can do in our lives, any data that can optimize the experience will help us make better decisions. Look for car brands (other automotive related brands) to embrace this data, creating better experiences and deeper integrations.